Gender equality is central to the process of scaling technologies and practices in a sustainable manner. Gender differences affect who does the research, how research is prioritized, how the research is designed and conducted, and how data is interpreted and shared. Similarly, gender norms and gender inequality within the cultural context where scaling is taking place influence uptake of technologies. Failing to take into account gender differences in needs, preferences, roles and responsibilities, access to and control of resources (such as labour, inputs, credit, and land), and power imbalances can limit the reach and scale of Africa RISING technologies. Africa RISING researchers can take advantage of a short guide to help ensure that proposals and interventions properly address gender issues. Mulema, A.A. 2017. 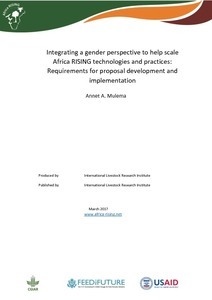 Integrating a gender perspective to help scale Africa RISING technologies and practices: Requirements for proposal development and implementation. Nairobi, Kenya: ILRI. 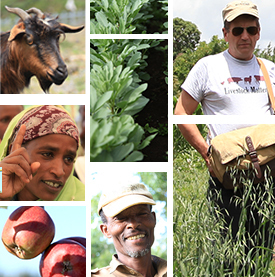 Tags: AfricaRISING, Gender, ILRI, USAID. Bookmark the permalink. It’s a good read and very informative.